No one knows quality like our team at Edge Stoneworks in Ozark, MO. 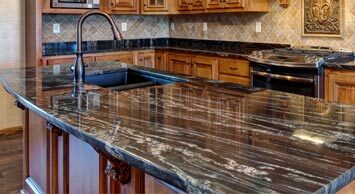 We offer competitive prices and provide the best countertop options in the State of Missouri. As a fully licensed and insured business, we ensure your peace of mind and comply with all regulations for every job we do. 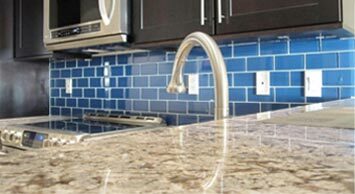 When you choose Edge Stoneworks to fabricate and install your granite countertops or stainless-steel sink, you can be assured that you’re getting reliable, professional work that will last a lifetime. With a quality assurance program and available lifetime warranties available, we’re confident that our standards will impress you. We only source stone from trusted industry suppliers. Whether you want marble, quartz, or granite countertops, you’ll receive products crafted from only the finest materials, including the top granite on the market. Edge Stoneworks was founded with the vision of changing the countertop industry by providing unparalleled service and craftmanship for every job. From the estimate to the reveal, we’ll make sure your experience with us is nothing short of perfection. Our team members are chosen for their integrity, passion, and skill, and we treat your home with the highest level of respect. Employing the finest people and using the finest materials is our secret to maintaining a quality business. Sometimes the perfect option doesn’t click until you see it in place. That’s why we offer the virtual designers feature on our website. This feature lets you browse through our available stone and sink options and shows you realistic renderings of how the product will look in your home. Simply upload a photo or choose a room, and it’ll do the rest. It’s a convenient way for you to know you’ll love the final product before the work has even started. The possibilities are endless for the edges of your new marble, quartz, or granite countertops. We have seven different edging styles available, but we’re happy to accommodate custom requests when possible. If you don’t see a style you like on our website, then reach out to us to see what we can do. Our countertop process puts you at the wheel. The process begins with a detailed project estimate, including materials and labor. Once we settle on the details of your project, you’ll choose the stone type and color for your countertops. Then, we’ll take measurements, draw out a template, and fabricate your custom counters. And finally, we’ll install the countertops for a look and product that you’ll love for a lifetime. With top granite and quality stones for countertops, a friendly and helpful team, and stunning craftmanship, Edge Stoneworks the perfect choice for your next kitchen or bathroom project. We boast a fast turnaround time of five to 10 days on average, and we offer limited lifetime warranties on our work. Plus, we service a broad area, including the cities of Springfield, Branson, Lebanon, Buffalo, Bolivar, and more in the State of Missouri. To get started, contact us today! For the best countertops, call today.